Dr. Chaudhri got a BSc in Biological Foundations of Behavior from Franklin & Marshall College in 1999. In 2005, she obtained a PhD in Neuroscience from the University of Pittsburgh, and completed a postdoctoral fellowship under the supervision of Dr. Patricia Janak at the University of California, San Francisco. Dr. Chaudhri joined the Psychology Department at Concordia University in 2010 as an Assistant Professor. She was appointed Associate Professor in 2014 and is currently an FRQS Chercheurs-Boursiers. Shaun completed a B. Arts (Philosophy and Psychology) and B. Science (Neuroscience and Pharmacology) at the University of Melbourne. He worked on the role of the orexin system in appetitive motivation during his Honours at the Florey Institute of Neuroscience and Mental Health under the supervision of Dr. Robyn Brown and Prof. Andrew Lawrence and his PhD with Prof. Gavan McNally at the University of New South Wales. His postdoctoral work in the Chaudhri lab involves studying the neurobiology underlying the Pavlovian associations that drive motivation for sugar and alcohol. Milan is a PhD student in the lab. He is using chemogenetic tools to delineate the role of target specific projections from the ventral tegmental area in alcohol-seeking triggered by discrete and contextual cues. In his free time, Milan makes beer and shares it with the lab. Franz received his BSc in Neuroscience at the University of Toronto. While in Toronto, Franz worked with Dr. Rutsuko Ito to study the role of the hippocampus in approach-avoidance processing. He joined the Chaudhri Lab in September 2015 and is currently exploring the neural mechanisms that mediate the extinction of responding to Pavlovian cues. His work uses behavioural tasks in conjunction with optogenetic and pharmacological tools. Outside of the lab, Franz enjoys listening to music and tries to keep his house plants alive. Mandy received her BA in Psychology at Mount Allison University in 2016. While at Mount Allison, she worked with Dr. Terry Belke and studied the effect of extrinsic reinforcement on intrinsically reinforcing operant wheel-running behaviour. 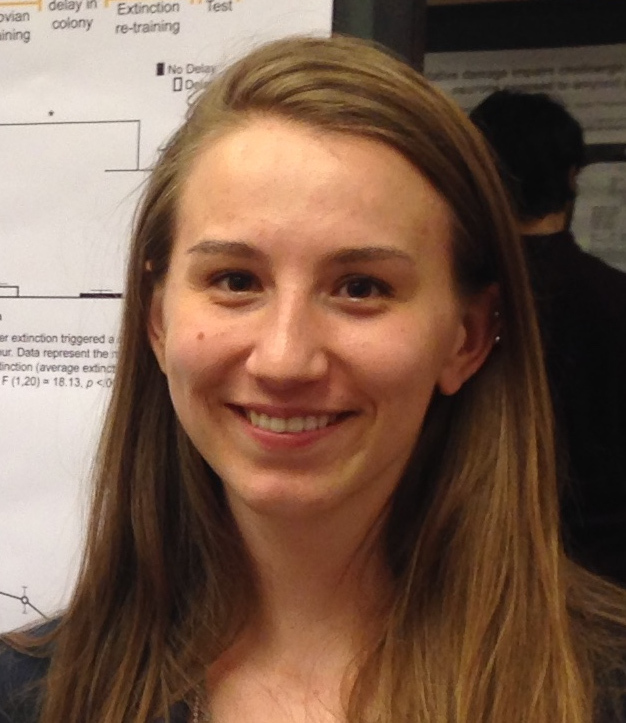 Mandy joined the Chaudhri lab in the Fall of 2016 as a Master’s student. She has developed some exciting new models of relapse to alcohol-seeking, and interested in using these models to test new manipulations that attenuate relapse alcohol seeking. When not in the lab, Mandy can be found at the curling rink or power lifting. Alexa received a BA in Psychology from McGill University in 2017. She joined the Chaudhri Lab as a Master’s student in 2017, and is investigating the neural mechanisms underlying extinction learning. In her spare time Alexa enjoys playing hockey and eating avocado toast. Post doctoral fellows: Jean-Marie N. Maddux (currently at Lake Forest College), Mayukh Choudhury. Graduate students: Lindsay Sparks, Jose Mendoza, Joanna Sciascia, Franca Lacroix, Atyeh Heidari-Jam. Undergraduates students: Soraya Lahlou, Nadine Padillo, Alexandra Bumbu, Audrey Zaari, Kathryn Goheen, Jessica Iannuzzi, Annie Pettorello, Chandra Srey, Dan Vinh-Chi Vo, Ziada Ayorech, Rayane Tabbara, Justin WHatley, Jessica Remedios, Rachel Young, Jessica Cummings, Catherine Tardiff, Sabrina Heffernan, Melanie Chahine, Priscilla Beharry, Christian Sanio.